Reduce Thermal Energy Losses and Promote Operator Safety! The Steam Turbine driving your Chiller relies on fuel energy in the form of heat to provide work output effective for the appliance performance demand. This "thermal energy" must be fully delivered with minimal losses to obtain maximum efficiency from the turbine unit. The greater the delivery, the greater the efficient heat/ work ratio. Losses in any thermal energies are a direct response to efficiency and performances available. A poorly insulated turbine casing is no different than dumping fuel from a filling nozzle! Improper or OFTEN completely uninsulated turbines result in inefficient "cooling" of the thermal energy as it enters the steam chest and velocity stages. Conversely properly prepared turbines maintain fully insulated chest cases assuring all the thermal purchases available are transformed to work output. The ThermaSave Performance Insulating Blanket does just this. 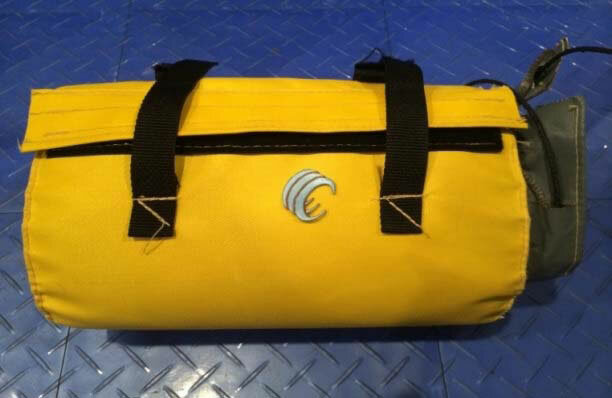 Built on PTFE injected fiberglass removable cores with weblon shielded cases and form fitting seamed finishes, you can be assured to reduce these losses and reduce your operating costs. 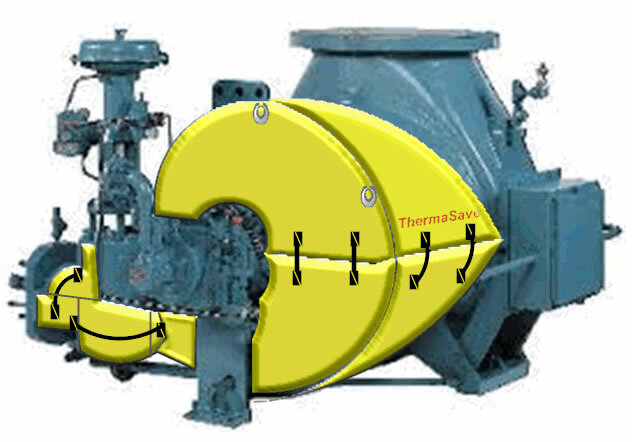 Each ThermaSave blanket is custom measured and fit to your turbine. Rated for 750°F operating temperature, ThermaSave blankets also provide operator safety, and API compliance preventing accidental contact with machinery cases. Finally a field retrofit available to ownership and operators offering safety and energy piece of mind. Uninsulated losses of over 100,000 btu per hour can result in over $5,000 per year of inefficiencies!